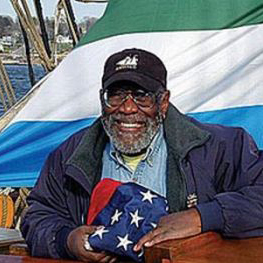 September 15, 1935 William Pinkney, the first African American to sail around the world solo, was born in Chicago, Illinois. After graduating from high school, Pinkney was trained as an x-ray technician and served in the United States Navy from 1956 to 1960 as a hospital corpsman second class. In 1977, he bought his first sailboat. On August 5, 1990, Pinkney sailed from Boston Harbor on a 47-foot cutter named The Commitment. He sailed around the five southern capes and covered 27,000 miles and returned to Boston Harbor on June 9, 1992, the fourth American and the first African American to sail around the world solo. In 1999, Pinkney set out to replicate the “middle passage,” the sailing route taken by slave traders from West Africa to Cuba. This time he traveled for six months covering 12,000 miles. On this trip, he was able to communicate with students in several hundred schools via on-line computer service and satellite television. In 2000, Pinkney became the first captain of the Amistad, a recreation of the 19th century schooner La Amistad. He retired from that position in 2003.